Kathy and Icarus are just like any other girls their age… Except for the psychic abilities, mentoring by PT Barnum (greatest showman and secret saviour of the earth) and fending off a collective mind bent on taking over the world! 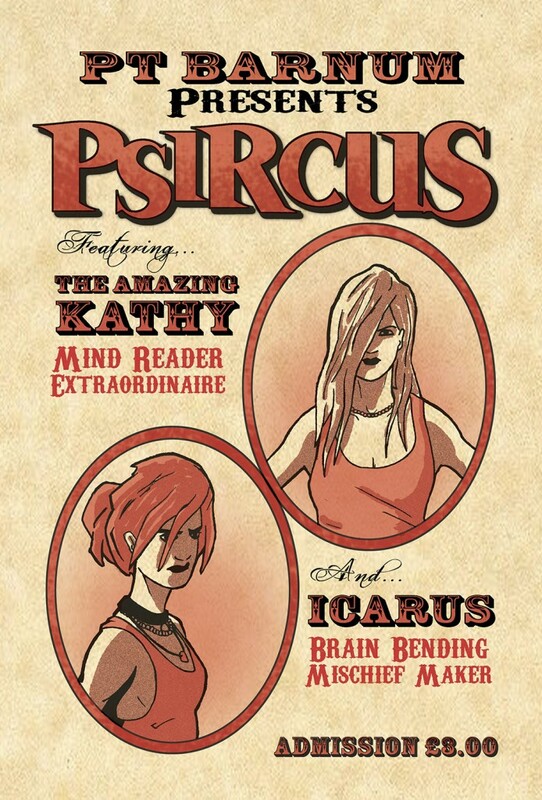 Discover their secret origins in PSIRCUS #1! Once upon a time there were two young ladies in possession of great abilities. Kathy spent a majority of her youth locked up in institutions. Believed to be suffering from paranoid schizophrenia and delusional fantasies, she was in fact exhibiting an enormous psychic ability. Icarus, not her real name, was removed from her family as a bay due to the extraordinary telekinetic abilities and was nurtured to become as living weapon. Assumed in to a secret society of psychics under the guidance of Phineas T. Barnum, greatest showman and secret saviour of the world, the girls play a part in a larger story yet to come. PSIRCUS! The Origins of Kathy and Icarus.